Clinical, IF, and histological examination of neonatal WT, C4–/–, and Fb–/– mice injected with pathogenic anti-mBP180 IgG. Neonatal WT, C4–/–, and Fb–/– mice were injected i.d. with pathogenic rabbit anti-mBP180 IgG R530 or control rabbit IgG R50 (2.64 mg/g body weight) and examined 12 hours after injection. 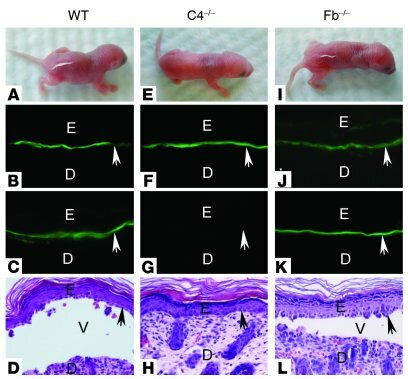 The pathogenic IgG-injected WT (A) and Fb–/– (I) mice developed extensive epidermal disease. The skin of these animals showed linear deposition of rabbit IgG (B and J) and mouse C3 (C and K) at the BMZ by direct IF. (D and L) H&E-stained sections from these mice showed a subepidermal vesicle with PMN infiltrate. (E) In contrast, anti-mBP180 IgG–injected C4–/– mice showed no clinical evidence of skin disease. Direct IF studies showed rabbit IgG (F), but no mouse C3 (G) deposition at the BMZ. (H) These animals showed no evidence of subepidermal vesiculation at the light microscopic level. Skin from mice injected with anti-mBP180 IgG was negative for BMZ staining with negative control antibody (FITC-conjugated goat anti-human IgG), and skin from mice injected with control rabbit IgG showed negative BMZ staining with FITC-conjugated goat anti-rabbit IgG and anti-mC3 IgG (data not shown). Four independent experiments were performed per group. Arrowheads denote sites of antibody labeling and basal keratinocytes. D, dermis; E, epidermis; V, vesicle. Magnification, ×200 (B–D, F–H, and J–L).